Heat oven to 400°F. Separate 1 can of dough into 4 rectangles. Place in ungreased 12-inch pizza pan or 13x9-inch pan; press over bottom and 1/2 inch up sides to form crust. Firmly press perforations to seal. 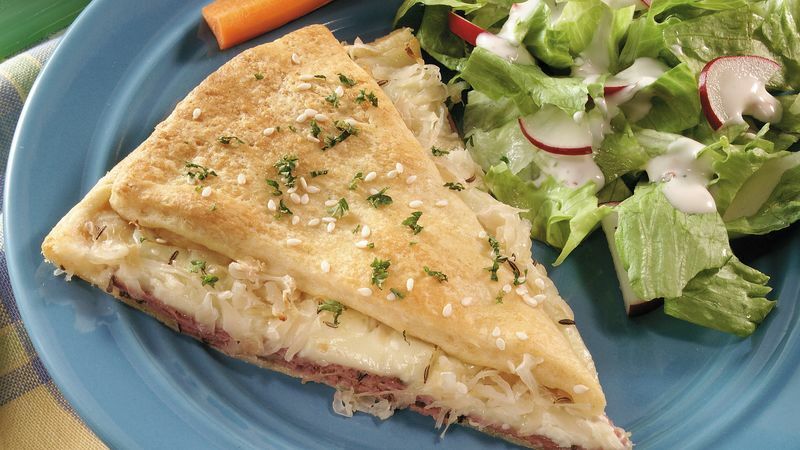 Layer pastrami, cheese and sauerkraut over dough. Sprinkle with caraway seed. Separate second can of dough into 8 triangles. Arrange triangles spoke-fashion over filling with points toward center. Do not seal outer edges of triangles to bottom crust. Sprinkle with sesame seed. Bake at 400°F. for 15 to 25 minutes or until golden brown.